You can merge data from two contact records, so that one record with the combined data remains active and the other record is archived. For example, you may have a contact who signed up as a member with his primary email address, then registered for an event using an alternate email address. You don't want to keep two separate contact records for the same person, so you merge them into one. As part of the merging process, you select the contact record you want to remain active and the other record to be merged and archived. Wild Apricot does not provide a mechanism to search for possible duplicate records. 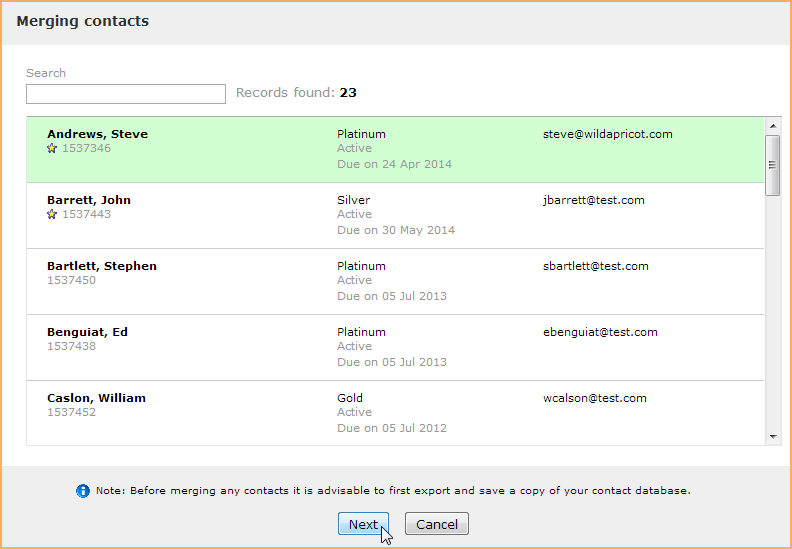 Before merging records, you should back up your contact database by exporting it to a spreadsheet. You cannot undo the merging of contact records. To merge two records, start by going to the Contacts module and displaying one of the two contact records – it doesn't matter which. With the one record open, click the Merge button towards the top. From the window that appears, select the other contact to be merged then click Next. Now, choose which contact record you want to keep active. The other record will be merged into the active record then archived. 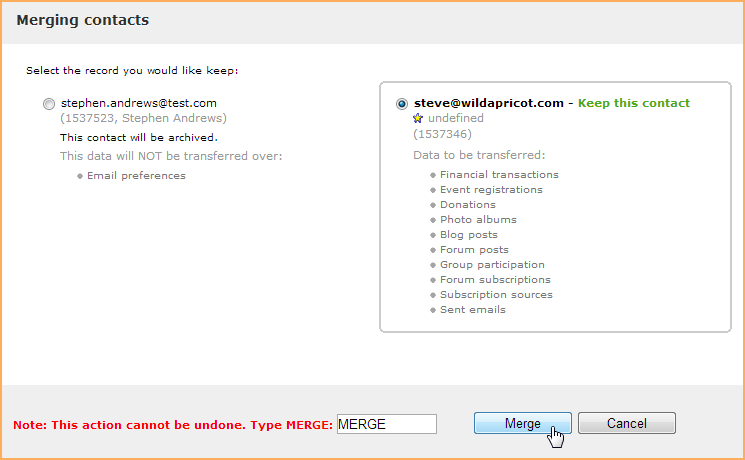 After you have selected the record to be kept active, type the word MERGE into the field provided then click the Merge button. Once the records are merged, a confirmation message will appear. 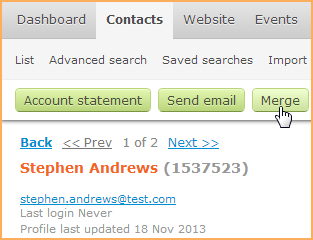 To find the archived record, go to the simple search page within the Contacts module and select the Archived filter. If any of this information appears in both records, the information in the record being kept will be retained.